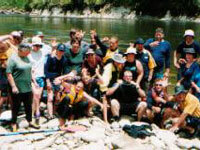 Joining the Taranaki Yakity Yak Club is a neat way to meet like minded people by coming along on our trips. You will explore awesome places with most of the trips all organised for you :) Taranaki has some great rivers and a beautiful coastline so why not come and get familiar with it!? We are often out on the sea and rivers. We have Saturday paddles most weekends and leisurely fishing mornings. If you would like to join our club, you will have to complete the Sea Kayak Skills Course or the White Water Skills Course. For dates and further information please contact us. A comprehensive course designed to cover the skills required to become a technically correct paddler. The course is arranged in a progressive manner to allow you to develop the techniques and your confidence at an enjoyable pace with great end results. In a heated pool we teach you about the easy ways of entering and exiting a kayak along with the methods of self and group rescues all in the beautiful warm waters of the pool. Saturday am: Lake at Waitara we work on paddle strokes, boat control and group and individual rescue. After Lunch we paddle on the lower Waitara river to give you an introduction to moving water, eddies and currents and to familiarise you with the river for Sunday. We start the day paddling from Spargo Road on the Waitara River developing moving water skills and safety techniques on moving water. The focus for the day is gradual progression allowing skills and confidence to grow. Join us for our famous introductory Kayak Course and join The Yakity Yak Club at the same time. The course is designed to accommodate both sit in and sit on kayaks and is run over a weekend starting on the Friday night. Sat am: Session on a lake covering all the basic paddle strokes required to control our kayaks. You will also have the opportunity to try out a range of different kayaks - both sit in and sit on top. Sat pm: Practice the rescues learnt in the pool in the lake or ocean. Sunday Paddle: On day 2 we put it all into practice on a leisurely trip at a range of locations depending on conditions. We cover weather, tides, gear essentials, lunch, paddle strokes, rescues, group management and more! To book on this course or enquire for further information please reply to this email or phone 06 751 2340. Eskimo Rolling - In a lovely Heated pool!! Have you always dreamed about rolling that kayak? Well winter is the time to learn. Rolling clinics run every week on a Wednesday night at NP Aquatic Centre . Come on down to a heated pool we start in small kayaks which are easy to roll and we can progress to long boats as your skills improve. Club Price 4 nights for $ 190 Drop in Fees ( if you have done a course or can roll already) $ 15 or $10 if you bring your own gear.